Online multiplayer servers were shut down in 2013. Patch 1.1 is the latest patch available for the game. Improves stability on systems with at least 3GB RAM by allowing the application to use more than 2GB RAM. Change the WindowWidth and WindowHeight values to match your resolution. 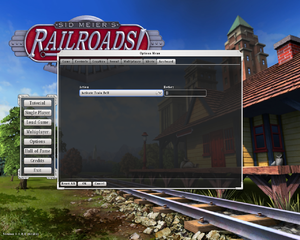 The game executable has a hard coded memory limit of 1 GB, with large maps this can causes poor performance and crashes. As most systems have significantly more RAM in them, it is possible to expand that limit to utilize all available memory. 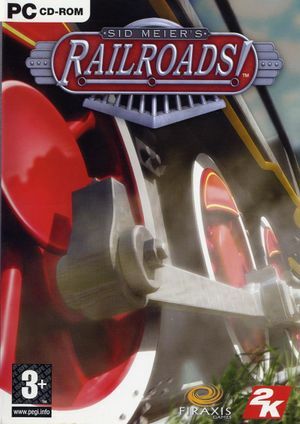 Download this executable and replace the RailRoads.exe file in the installation folder. 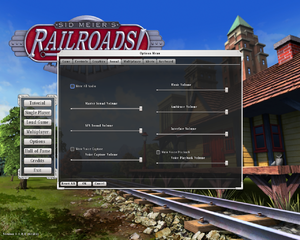 Note: Users with macOS versions prior to 10.14 can select the branch mac_retail_111 - macOS 10.13.6 or older only from the Beta tab on Steam. This enables the game to run with the legacy OpenGL backend on macOS >= 10.12.4. ↑ 1.0 1.1 File/folder structure within this directory reflects the path(s) listed for Windows and/or Steam game data (use Wine regedit to access Windows registry paths). Games with Steam Cloud support may store data in ~/.steam/steam/userdata/<user-id>/7600/ in addition to or instead of this directory. The app ID (7600) may differ in some cases. Treat backslashes as forward slashes. See the glossary page for details. This page was last edited on 30 March 2019, at 07:29.